LIBRARY STUFF: WHY AREN'T CHILDREN READING IN SCHOOLS? 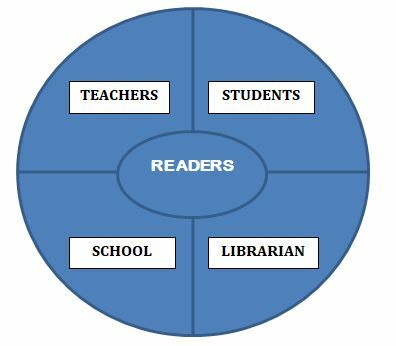 There are four major factors involved in creating readers. Actually I should really say there are five because the home environment has a huge impact, usually before any of the other four participants appear on the scene. But I’m focusing on creating readers in a school setting here. I’m also aware that many schools do have children who read but, unfortunately, many don’t! · Many have no in-depth knowledge of children’s/teen/YA books so they are unable to recommend an appropriate book to a student. They often have no knowledge about new authors, who writes like, what to read next, award winners, popular authors or genres. · Many consider themselves to be “non-readers” so are not visibly seen as a reading role model by students. Most people read – newspapers, magazines, websites, fiction, non-fiction (it all counts) – yet do not share this with students regularly. · Even if they are avid readers they are often only familiar with the type of books and authors they like, or non-fiction connected with their subjects. · Some don’t see reading as being “their” responsibility. · Most are too busy, overworked, under pressure and stressed to take time out of a busy curriculum to explore books and reading with the students. · So many have not had any “good” reading experiences. All their previous reading experiences have been with books they were forced to read that they did not enjoy or understand. This reinforces the idea that “reading is not for them”. · They have no family background of reading; there are no books at home, they were not read to as a child or taken to the library thus they have no reading role models in the home. · If they never see an adult reading they will make the assumption that “not reading” is adult behaviour which they will emulate. · They don’t know what sort of reader they are or what sort of books they enjoy. They have not been given the opportunity to browse and explore a varied collection of books, to make mistakes in what they choose, to discuss their reading likes and dislikes with somebody knowledgeable who can make suggestions. Thus they will find it difficult to select a suitable book. And if they always choose a book that they find boring or too hard it will reinforce the idea that they don’t like reading or that they can’t do it. 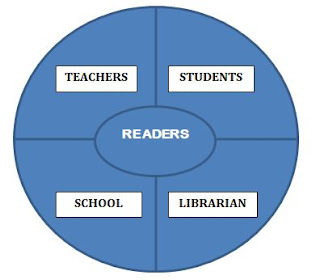 · If the librarian is not given any status within the school, and their skills and expertise are not recognised by the staff, they are often not used to support and engender reading. · Many librarians are solo workers with no dedicated time to spend with students discussing books and reading, guiding them in their choice of reading material. If students aren’t given allocated lessons in the library and the only time it is available to them is during breaks, those who do not like books or reading will not be anywhere near it then! · Often librarians are relegated to a “babysitting” role, much of their time is taken up with administrative tasks or they have additional jobs within the school such as photocopying or covering the reception desk. This prevents them from fully engaging with the students and building up relationships so they can give advice and support, and make recommendations. · The school does not have a librarian so there is nobody with the necessary skills, knowledge and expertise. · If there is not a whole school reading ethos and reading is not valued it is likely that students’ attitudes will mirror this. · Often there is no SLT support for reading for pleasure with the focus being on reading for attainment and reaching target levels rather than creating readers. This focus is unlikely to create lifelong readers who challenge themselves, read outside their comfort zone and question what they read. · No time is given for reading in the curriculum. Library lessons, browsing and silent reading are all seen as a “waste of time” because the impact of these activities is difficult to measure. · There is no SLT support for the library or librarian. They are not seen as a professional or adding any value so they receive little or no budget. If the library is not supported financially it can’t buy new books or run activities to encourage and sustain reading. · This lack of recognition often means the librarian is not included in relevant meetings or initiatives, nor are they given the information needed to do their jobs properly. Creating readers is a long-term mission; there isn’t a simple formula that can be applied and it will not happen overnight. Ideally it needs everyone on board, from the SLT through to the staff, and the librarian should be recognised as a valued professional colleague with specific skills and expertise. It can be done without all four aspects being involved – I’ve worked in schools where I wasn’t really supported yet managed to create readers (although it pains me to think of how much more I could have done if I’d had that support) – but the one factor you really do need is a librarian. Books are the tools of our trade and most of us are slightly obsessed with them. So it’s no surprise that we know Patrick Ness has another book nominated for the Carnegie Award, that Jim Kay who illustrated “A Monster Calls” is also illustrating the Harry Potter books (number four due out later this year – fingers crossed) and that Chris Riddell has a new poetry book out in September! If I want advice on my boiler I talk to a plumber. Likewise if you need advice on books and reading, talk to a librarian. Great blog post Barbara! You are so right that reading is a whole school responsibility. Teachers especially need to lead by example and the status of the school librarian does make a huge difference. It is too easy to say that there is no time for reading but there is alway time for everything you value in life and reading should be one of them. An excellent blog post - may copy it to the new HM, who is a stranger in the Library, and all SLT. At least will post it on the notice board. In fact that gives me a great idea for a display. I'm taking on the role of Assistant Head in charge of teaching and learning , and reading for pleasure will be a focus of mine in our school!